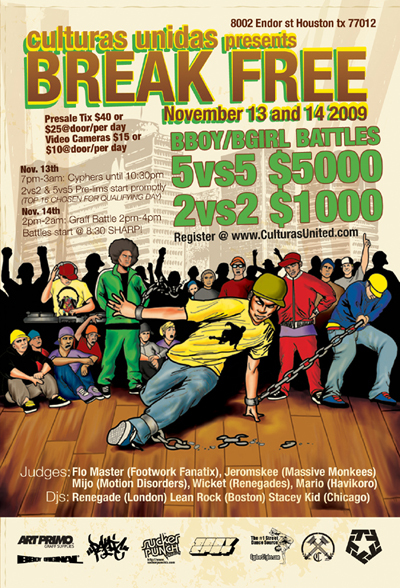 November 13-14th come join Culturas Unidas for their 2 day battle BREAK FREE! Big ups to Jeromskee from Seattle! Represent! The first day will be a day of open dance circles, dj showcases, a two on two dance battle prelim and a five on five crew battle prelim, which would allow the qualifiers to compete the next day for the grand prizes (trophies, cash, and merchandise). The second day will begin with a graffiti exhibition, allowing local and very well known artists from all over to participate freely on legal walls and canvases. The best piece will be determined and the artist will also receive a grand prize package. Culturas Unidas promotes creative expression through the art of dance in efforts to help individuals (children, teenagers, and young adults) begin to build a future as an artist. Our goal is to provide at risk communities access to a safe environment away from drugs, gangs, and unproductive lifestyles, where creative expression creates and promotes individual goals and success. We believe all individuals deserve an opportunity to grow regardless of race, economic status, or background. We hope to lay the foundation to help individuals make a positive difference in their life.